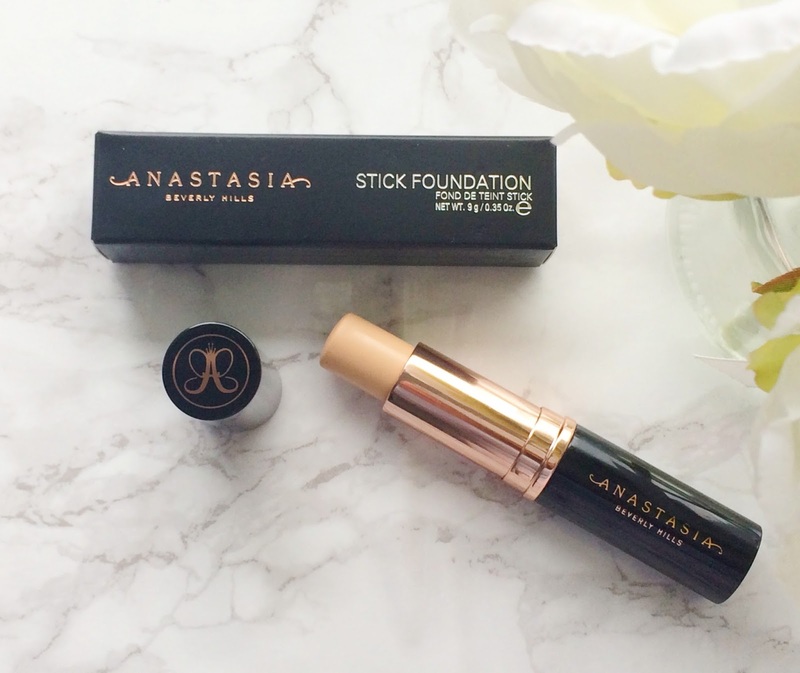 I like the sleek black packaging with gold detailing that is standard for most Anastasia Beverly Hill products and it contains 9g of product, which should last quite a while because I find that I don't need to use very much. When I first opened it and swatched it on my hand, I really wondered why I had bought it because I thought that it looked almost powdery and we all know that I like a dewy or glowy finish. Nevertheless, I decided not to give it a try with an open mind and knew that I should use my trusty Clarins Beauty Flash Balm to prime because every foundation that I have tried always applies beautifully over this. I applied a few stripes on my face, starting in the centre and working outwards. My favourite foundation brush at the moment is Sephora Pro Flawless Airbrush #56 so I used that to apply the foundation and I have to say that I was pleasantly surprised - it glided over the visible pores on my cheeks, blurring them until they were pretty much invisible and my skin looked very smooth and not at all mask-like. The coverage is light-medium, but I applied an extra bit on some patches of pigmentation that I currently have as a result of my skin/meds reacting badly to the sun on holiday (despite wearing SPF 50) and found that it layered well without looking cakey. The finish is satin, definitely not too matte but not dewy. I finished my base with a few spritzes of Tatcha Luminous Dewy Skin Mist, which I use every time I do my make-up because I just love the dewy finish it gives my skin. After a few hours, I noticed that it was a little cakey around my nose and chin so I used some more Tatcha Mist and then followed with the beauty blender and it looked fresh again. It hadn't disappeared or budged at all really on the rest of my face but I have dry skin so I am unsure how it would work on oily skin. I only wore it for around 6 hours the first time I applied it and I've worn it a few times more since then but the longest period has been 8 hours so I can't comment on wear-time outside of that but I have tried a few methods of application - fingers/beautyblender/dense buffing brush but the Sephora brush is my favourite method and the Clarins primer is also the best one I have used with it, due to how moisturising it is and how dry my skin is. Overall, I am happy I bought this foundation and although it isn't 'the one', it is pretty damn good and I love how easy and quick it is to apply. I can't say that it will be the first foundation I reach for because I prefer a dewy finish, but it is definitely one I will use on days when I want a quick & easy application. I think it would be ideal for normal to combination skin types although those with dry skin can get away with it as long as the skin is well prepped. I'd love to hear your thoughts on this foundation and stick foundations in general? Have you tried any of the others I have mentioned? Please tell me in the comments below!